I first tried to read Pride and Prejudice when I was about eighteen and I read maybe the first two pages before giving up. I've just never been very good at reading classics. I'm always letting the differences between the English of Jane Austen's day, for example, and the English I speak now get in the way. It's a habit I'm trying to break. I've always felt a little bit guilty about never having read any of Jane Austen's novels. She was a big part of my English Literature course at university. In the first year we studied Sense and Sensibility. I watched the film, broke the spine on the book to make it look like I had read it, and stayed very quiet during our seminar on it. In the second year we studied Persuasion and I honestly don't even remember how I dealt with that, which probably means I skipped the seminar completely. In our third year we were offered a module just on Jane Austen's novels and when a friend of mine picked it I asked him why he wanted to torture himself like that. I was so wrong. Now I get it. No one ever told me that Jane Austen's heroes are kind and sensitive and her heroines are stubborn and eager to please and outspoken and shy and everything under the sun because no two of them are the same at all. They all have their own merits and flaws and they all have their own stories. No one ever told me how great her characters are full stop, honestly. I had no idea how much I would love Mr. and Mrs. Bennet, or Mr. Woodhouse, or Mrs. Jennings, but I do. Every one of them. 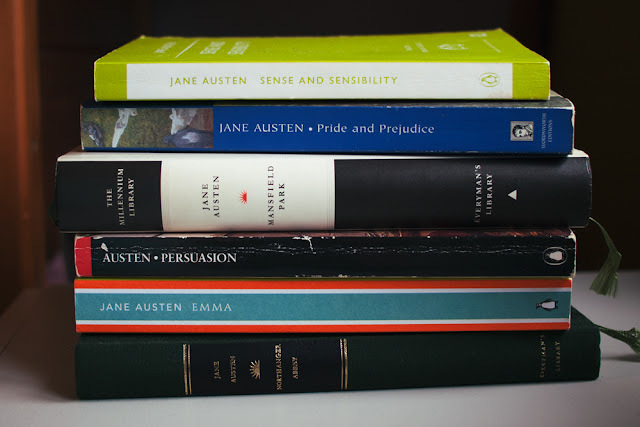 If you've never read Jane Austen, don't think of her like I did, as this great writer whose work you have to read just because everyone tells you so. Read her because her characters are complex and her writing is funny and smart. If you, like me, tend to read a lot of YA fiction, read her because it'll give you a relieving break from the insta-love that plagues a lot of otherwise great books. Just don't be afraid of Jane Austen. She's a lot more down to earth than your English teachers might have you believe.